The Presidio is where San Francisco began. A former military outpost, it is now 1500 acres of recreational area. Please join us as we explore this beautiful corner of San Francisco by foot! Our path for the most part will follow the Presidio immersion loop. 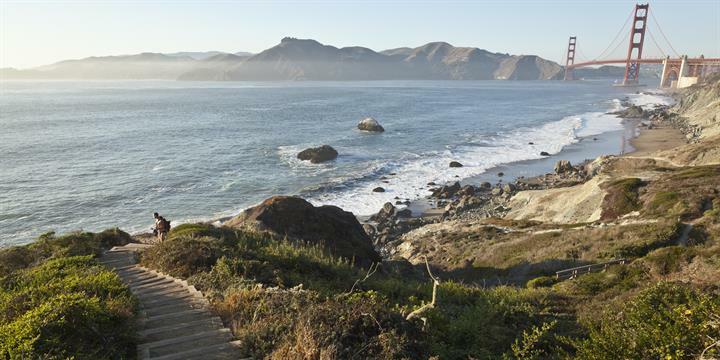 It includes views of the Golden Gate bridge, the gorgeous Batteries to Bluffs trail, Immigrant point overlook and trails through forested areas. This hike will be at a relaxed pace meant to take in the surrounding beauty, to afford photo breaks and minor detours. Bring along enough water, sunscreen and please dress in layers. Even on a warm day, the western coast can be windy and chilly. Dogs are not allowed as there's a coyote advisory on some trails. Paid parking is available near the visitor's centre.